I have used these before and would buy again. WE used this under the cushions of a small couch to help with the sagging. Makes a big difference in the sagging of the cushion. Just what we needed !!!! we used this on our couch, it's the kind that fold out to a bed, no more slump in the cushions!! Since I am on a fixed income, this really fit the bill for my old couch. Now I don't sink to the bottom of my couch. This is really great. My work out webbing of porch chairs were stretched. I put this between the webbing and the cushion and it worked perfectly. A close friend with back trouble is not able to sit on my porch and visit. The seat savers improve the quality of my 25 year old sectional. People don't sink down in the cushions. It is a good idea ant thrifty, save one having to buy new furniture when the top part is still in good condition. Like having a new couch. Great product..provides much needed cushion support to my leather sofa. Previously bought a competitors product (Furniture Fix-It) that damaged the leather. This product is perfect and leather-friendly. Will order a second for a little added support. I have brought this before and would buy it again. I've got one on my love seat because the cushions aren't sagging, but feel too soft. He bought one to put under his think cushion he sleeps on in his van so he doesn't feel every gap between the slats. He's happy with the purchase! I used this on our couch just to help the cushions to be more supportive. I love it and it's easy to wipe clean if anything spills. I would recommend this ! This saved me from buying a new sofa right away. The pricing was great and easy to install. It's like a new chair! I ordered this for my daughter and she loves it. She said it's like having a new chair. She's very thankful. Arrived in good condition, works as expected. Used to give added support to couch cushions. Great for outdoor furniture, too! I used the loveseat size saver to revive my worn out porch glider. It works great! Adjusted the size by folding one slat. Doesn't show when the cushions were added. Waterproof. Very comfy, too! This product works great with my furniture in living room. It makes the seating much more sturdier than it was before. I am thrilled with this product. I need some added support for a new loveseat that the cushions kept sliding. This was my solution !! Works great! I am very pleased with this product and highly recommend it to all. It really works well with my furniture that I have had for a number of years. It does make the seating area much sturdier! My sleeper couch cushion was starting to sag. Otherwise the couch is in good condition so I don't want to replace it. Because the couch seat is deep I purchased two of these and put one next to the other with a little overlap. It did the trick! The couch is much more comfortable now. I purchased this cause the sofa was sagging in the middle. It worked great, feels like a new sofa nice and firm and no sagging. I loved the one on my love seat when my cushion was too soft. I ordered this one for my son to put under his foam vinyl covered mattress in is van. He said it's a lot more comfortable now and he doesn't feel all the air holes in the board supporting his mattress. Bought these savers for my moms old couch and chair. I ordered two sets for each one as another customer had advised. They made a huge difference for the price. This product is excellent! I bought enough for my sofa, love seat and wing chair & am pleased with my purchase! Love these cushions. They really work. I use them for supporting my sofa cushions. Hoping to use the product until I can afford to buy a new sofa. It kept my sofa from sagging even though I have no broken springs. I bought these for myself a while back, and my son wanted some since he saw what a difference it made with my couch. So I ordered them for him and he is so satisfied with them. I would recommend them to anybody who has saggy cushions on their furniture. I am using the seat savers in a couple of older chairs and they seem to work very well for what I wanted them for. Best product I have ever bought to protect my couch. I use these sofa & loveseat Furniture Savers, it prevents cushions from sagging, they give just the right support. You can wipe them down with a damp cloth every so often if you like. They also support quite a bit of weight. Best thing I ever bought. When you sat down on my loveseat without the product it measured 15" from the floor. After sitting on it with the product it measured 16". I would say it helped it. I purchased cushion supports for my love seats. They were sagging and uncomfortable to sit on but now with the supports inserted under the cushions I have given new life to my furniture. We sit up higher and it feels like new furniture. Love them! I purchased a second hand chair and wanted better support under the cushion. It is a good support piece. Our couch was getting a bit soft and with sofa saver it makes it alot more comfortable to sit on and get up from. This is great for any couch or chair that sinks so low you can't get up. I'm thinking about getting this for my bed. Used this for a larger wing chair and fit great. like the folded tabs that can be cut away if needed. Chair is new and product because of section pieces wasn't even able to know it was there. Adjusted perfectly with spring system in chair. Expectional value at a great price. Prolongs the life of my "favorite chair" - and makes it much more comfortable. Just perfect for my chair, now you don't sink into it. I've had one for years because my love seat cushions were just a little too soft for me. This gave me the extra support so I don't feel like I'm sinking down. I bought this one for my son to use in his van he's converting. The platform bed in his van had too many holes he could feel through his mattress so this still allows some ventilation through the uncoverd hole and he doesn't feel them. He's happy with the product. Made my old chair like new! I did not buy due to pets, it helped me save a loved chair. I may order another, just in case it needs a bit more support. Works great. Will likely order another. Use for living rooom sofa. Added firmness. Seems like it will work great!!!!!! I bought this to use at my home because my chair is an overstuffed chair and it sags in the middle when you sit on it. I think this will make my furniture last longer and will remain comfortable to sit on. I have had several kids at my home and they like jumping on the furniture (even though I don't like it) and that has caused it to sag more than it should "at its age". Good product!!! The seat savers really help! The chair seat savers really help the support on 2 older chairs. It helped lift up the cushions in my old couch that should be replaced. After reading other reviews, I purchased two for our sofa. I doubled up on them and it really seamed to make a difference in the sagging :). We are pretty critical of these types of things and were pleasantly surprised. I'm not sure how effective they are just using one, but two is worth it to make your couch feel firmer. We purchased this item to give our sofa a bit more support. allowing us to get up from it more easily, and stop sinking into our cushions. It is a pretty decent quick fix, but not as firm as we'd hoped. I used this item to firm up an old rocking chair; it works well, and the foldable slats make it easy to change the size of one dimension. Unfortunately, both dimensions needed to be changed, so there is a bit of the support hanging over the end of the chair. I bought one of these for my living room couch, and when my daughter moved back in temporarily taking over my living room, I put it under my mattress. Lo and behold, NO MORE SAGGING! I have been unhappy with my mattress since not long after I bought it and am so happy to have discovered this. I am buying two more: one for the other side of the bed, and another for the couch. I am very pleased with the product. Made new fruniture better. We also purchased estate sale couch and chair and made them very comfortable to sit on. Extremely easy to use. It firms up the seat and cushion. I bought this to use at my home. I have a love seat that I have spent many a night sleeping on so it tends to sag some and is becoming less and less comfortable to sit on because you sink in. Plus kids jumping on the furniture has broken down the springs and the "love seat saver" will help to make the love seat more comfortable to sit on again. You won't feel like you are being swallowed up by the love seat anymore with the "love seat saver"! Much better quality than I expected. I used these for my daughter's futon. You can't feel the metal slats anymore. The last time I ordered something similar, I got cardboard. These are much heavier and more durable. Support of seat cushions on our "thrift store" discovery. Also helped increase support on one side of a King size bed. These give sagging furniture new life. THIS SUPPORT WORKED GREAT ON A LITTLE COUCH THAT IS USED EVERY DAY. I WAS SURPRISED. 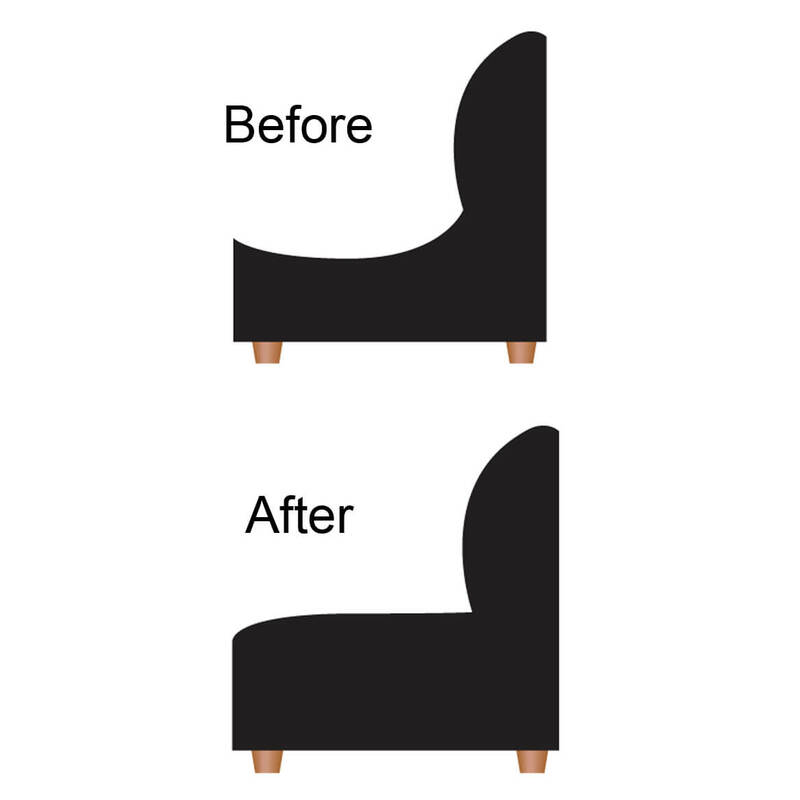 IF YOU LIKE YOUR COUCH, THIS IS AN INEXPENSIVE WAY TO FIRM IT UP, RATHER THAN BUY A NEW ONE. YOU CAN'T BEAT THE PRICE.IT IS SUBTLE, YET BETTER. SO EASY TO INSTALL. I AM BUYING ANOTHER ONE RIGHT NOW FOR ANOTHER COUCH PLUS 2 CHAIRS. BUY IT, AND TELL YOUR FRIENDS. easy to see the difference. They made sitting on the loveseats much more comfortable. You do not sag to the floor. I had one for my old love seat I got as soon as it started to sag. It helped. I put it on my new love seat as soon as I bought it to prevent sagging. I believe it's a good investment for prevention unless you spend really high dollars on very well built furniture. I found that this product still not what I thought it would be - couch still sags some. 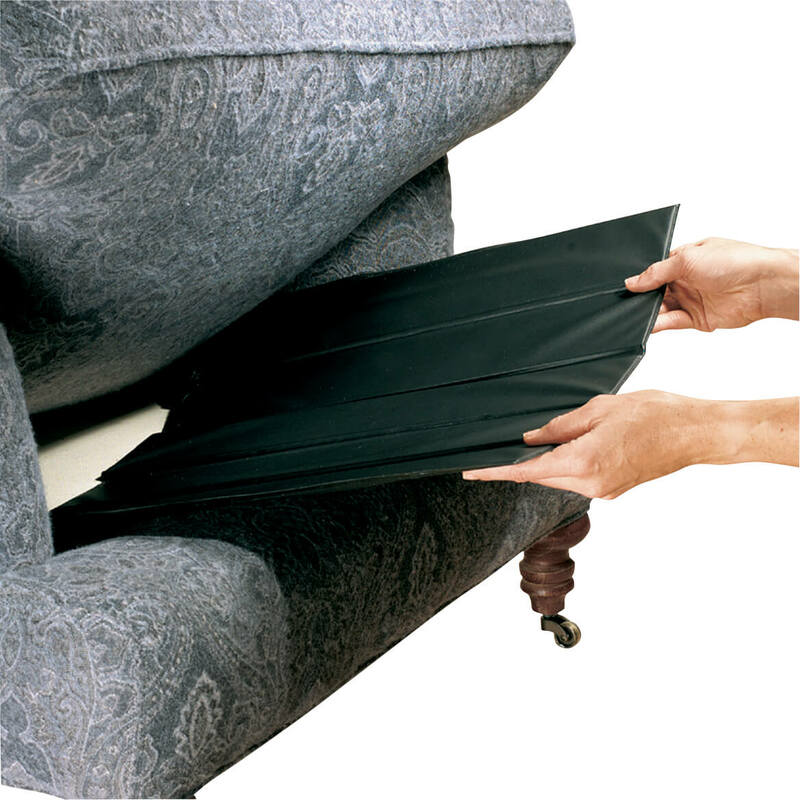 I am writing a review for the couch saver so I have no idea what that has to do with having pets but if you have older furniture and cant afford new, this is a great product to improve the the firmness of your couch cushions. I didnt give it five stars because new furniture would be the perfect solution. Try this and you will be surprised at the difference it makes. Gives some sofa or chair support but it is very thin. Seat saver cushion NOT used for support. I placed seat saver on TOP of sofa to keep my dog off of the couch. Also,I place the small one on top of chair to accomplish same thing. It works. My dog Sadie doesn't like to use them for her naps! This item was helpful in making our love-seat cushion feel a bit firmer. I like the way it folds to fit. These are better than the hard plastic, snap-together kind I have under my sofa cushions. I used these years ago and have been searching for this kind to use under my love seat cushions! I bought two love seat seat-savers for our 80 inch sofa. It seems to be working pretty well. this make the sofa nice and firm. make the sofa sit better. to prevent the seat from sliding off. This is the second time I've purchased one of these.It helps to prop-up a little sag in my sofa. I don't need to buy another sofa or change the foam in the cushion which is very costly. A good money saver. This works great to get a little more life out of your sofa. The cushions were sinking in and not comfortable. Now you can sit comfortably on the sofa. I like this product and am about order more for my daughter. The chair support and the sofa support are especially good if you have children that love to jump on furniture even though they have been told not to do so. The furniture savers do help. Easy to use. Easy to use, and do help add firmness to cushions. Seat saver cushion support works just like the advertisement states. You'll want them for all your armchairs & sofas. i got this one cuz one side of my love seat sags down from a broken spring or two as the love seat is 25 years old plus. it doesn't do too bad of a job at keeping the cushion up but i think because there's a broken spring it doesn't hold up as well as it could if the problem were just a saggy cushion. but i'd recommend it cuz it certainly helps. we have a large Overstuffed Chair and I would sit to low.I ordered the chair saver and it has helped so I don't sink as low as I am quite short. My sofa is a sleeper sofa. The cushions were still firm, but I guess the springs on the mattress are getting worn, so it felt like the sofa was sagging when sitting on it. I actually put 2 sofa savers on, and it definitely makes a difference. Sofa feels much firmer to sit on now. This product is made very well but my sofa cushions needs new foam and when I sit down I don't feel a difference with the seat saver support. I will keep it though,but it just didn't work for me like I thougt it would. It also slips backword and needs to be adjusted often. Needs directions. Doesn't say which direction to place it. Probably self explanitory on sofa but I just got for chair. Thanks for helping to save my couch. It's better than nothing but I think a piece of board would do a better job and cost much less. Apparently I weight too much! They don't seem to help too much but husband thinks they do, he's underweight! I used the product as shown in catalog. It made the loveseat a little more sturdy. I used these on a loveseat in the living room. I was a bit disappointed in them. They didn't correct the problem as well as I had hoped. There was still too much sag in the middle. This helped my loveseat's sagging cushion problem a little --just enough so the middle cushion doesn't sink below the frame. I guess for the price it was a lot better than having the springs redone! Yet it is just a very temporary slight fix. Not much support and alot of smell. Product is for sofa and stuffed chair support. Support not great. I ordered this product for my couch and loveseat and didn't find that it made much of a difference for the cost. I think two of them together would work but am not willing to spend this much again. I am not a picky person and don't usually write negative reviews. Don't purchase this item. Waist of money. Will not recommend to my family or friends. It's nearly worthless. I would return except for the weight and high cost of postage. WD does not use a postage paid return label. will not stay put ! The furniture saver was as described but not as thick as I needed. I use it to fix a section of my sofa that the one had didn't cover, but is not as thick as the one I have so doesn't give me the support I need. sofa. Sorry to say it barely adds support. Though inexpensive, it does t help enough to make a difference. The produce was immediately placed in the loveseat. When I sat down, I noticed a SLIGHT change in support. I just expected more. I purchased both the love seat size & sofa size furniture savers, I put it under my love seat pillows & it did absolutely nothing. Because of moving had not used the sofa furniture savers, nor am I able to return the product. I am very, very disappoint in both this product and some of the services that this company does not offer. I rated this product only because without one I was not able to leave the page. It is not stiff or firm enough so it dont make sofa any better.. it still sinks in.. It was too small for my seat. It didn't made a difference. I think it should be improved. What a waste of money. They fit my chair ok but did absolutely nothing to make it feel more firm. If it wasn't so inconvenient I'd send them back! Could not tell a differance. Thumbs Down. This item is about as useless in my couch as spare change in my couch... money out of my pocket and not benefiting anything. Does not support or revive sagging couch. The love seat feels no different with this in place. Waste of money. DO NO RECOMMENDED FOR SOFA SLEEPER! WOULD NOT RECOMMEND FOR A SLEEPER SOFA, DIDN'T SUPPORT CUSHIONS. Hope to revive the one seat on the couch that has sunk more than the others due to constant sitting on the one part of the couch. My leather couch is sagging. will need it when I have bilateral knee surgery this month. I would like to get more life out of an old couch. My seat cushion is old and needed a lift. I'll probably buy another one soon. Recommendation of friend...Wdrake www address from her! I ordered! I want this so I can make my chair usable until I can afford a new one. not that great - not sturdy. To help keep the sofa from sagging. I couldn't it anywhere else and I need it. Good price, I have seen this item in other stores for much more. I didn't receive it yet but it looks to be long enough for the size of the sofa. Because I need to renew the seating of an old sofa. My couch seats sag in the middle and i've used this item before and they work really well to keep them sturdy. Couches (or anything else for that matter) aren't made like they used to be. I needed something for my sagging sofa and this will do the trick. Thanks for having my solution. To fix my old saggy couch. Do you sell furniture savers for sectionals? BEST ANSWER: Thank you for your question. Unfortunately no, we do not sell this item specifically for sectionals. We do offer this item in three different sizes which could be used for a sectional. We have included below the sizes we offer. We hope this information will be of help to you. Chair is 22" x 19"
Love seat is 19" x 44"
Sofa seat savers are 19" x 66"
what if my couch is 75" long and 24" wide? BEST ANSWER: Thank you for your question. Unfortunately the item will not fit your couch and we do not have any items that will. We hope this information will be of help to you. What if my couch is wider and longer? BEST ANSWER: I have a sectional couch. I just brought more and overlapped them. works well. do you have anything like the seat saver for beds? BEST ANSWER: Thank you for your question. Unfortunately we do not carry savers for beds.We hope this information will be of help to you. will the couch cushions slide as you sit and stand? BEST ANSWER: No they don't slide. Cushions stay in place. no they don't, they stay put. Nope they are really great. What is in these couch savers wood or hard form? BEST ANSWER: Extremely firm plastic I think. Whatever it is, they're the best we've found in the Marketplace because they actually work! Our 20 year old sofa feels like new again (we bought 2 for the bottom because my husband likes very firm seating ), so we bought them for our new sofa and love seat for added support. They look like they'll wear like iron, too! We're REALLY HAPPY AND SATISFIED with ours. They're well worth every penny! Thank you for your question. It is medium-density fiberboard encased in PVC. We hope this information will be of help to you. How many panels will I need for a sofa?